Elissa Sampson, visiting scholar and lecturer in the Jewish Studies Program, will be honored May 18 with a Lower East Side Community Hero Award as part of the Lower East Side History Month celebration in New York City. The award recognizes community members “whose contributions have been deeply meaningful and yet are often the ‘unsung’ heroes of the neighborhood,” according to the award announcement. 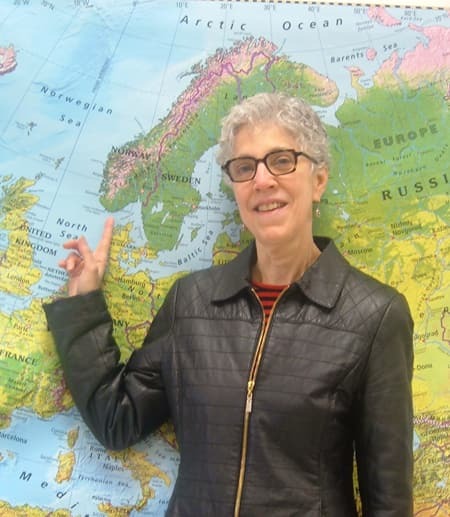 A longtime resident of Manhattan’s Lower East Side (where her Polish Jewish immigrant ancestors once lived), Sampson has been an advocate for neighborhood preservation activities at sites that pertain to Jewish immigrant history, labor history and current communal life. They include the now-landmarked Bialystoker Center and Home for the Aged on East Broadway, the Eastern Dispensary on Essex Street, the Second Avenue Historic District for Yiddish theater and the Yiddish Theater Stars Walk. Sampson is an urban geographer who studies how the past is actively used to create new spaces of migration, memory, heritage and activism. “I present Jewish urban experience as a spatial window onto processes of modernization and migration/immigration,” she explains. “Thousands of years of Jewish urban life offer a useful documentary record as a source for insight in a world that became preponderantly urban in 2008.” In 2008, for the first time in human history, the majority of human beings on planet earth were urban. The trend has only accelerated since then, Sampson said. Her recent publications touch upon Jewish life today in the Lower East Side, contemporary Yiddish theater, commemoration of the Triangle Shirtwaist Factory fire, the academic use of the term “ghetto” in relation to East European Jews in the U.S., and ethnicity and museums. Her courses at Cornell include The Lower East Side: Jews and the Immigrant City, and Jewish Cities. Both courses examine Jewish urban life through a comparative focus on citizenship, nationalism, intergroup relations, identity and re-diasporization.